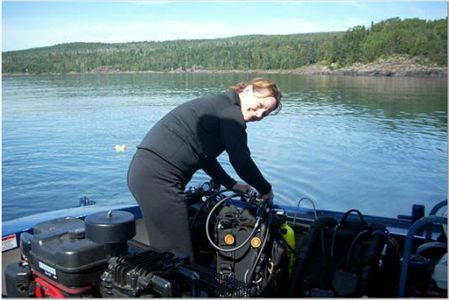 Friday evening after loading a lot of equipment, gear, doing a boat briefing and handing in the boat liability forms, we departed at 10:00 PM for a long cruise to Two Harbors. The cruise was as smooth as glass but very dark since it was the start of a New Moon. Once underway Bob Olson and I discussed the cruising detail for the evening. 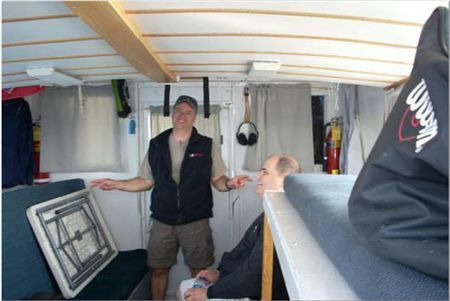 Bob O would start the cruise and I would take a short knap until Bob gets to point of not being able to stay awake. At 12:30 AM Bob waked me and I (Phil Kerber) took over to bring the Preservation into the Two Harbors break wall for overnight layover. At 7:30 AM Bob and I woke the rest of the crew and set coordinates to the Charlie anchor established last year by Bob Nelson, Bill Wallace, Stan Braun and I. When we came close to the coordinates we dropped the marker where we thought the anchor was actually sitting. Thanks to Bill Wallace and his memory we where able to line up points on shore and watch the depth of the water along the shoal to aid in finding the anchor. The coordinates in the Steve’s book, “A Divers Guide of Shipwrecks along the North Shore” are not correct. The book coordinates indicate that the anchor is 2.5 miles on shore. The safety briefing was presented to all of the crew. 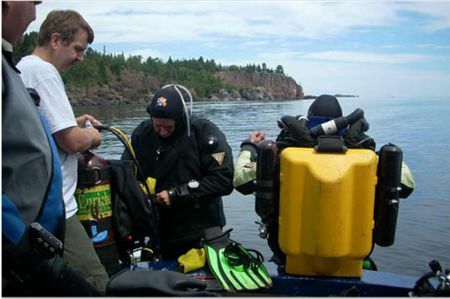 The first team of divers, Pat Olson and Linda Negus, started getting ready to go down to find the Charlie Anchor and tie off the anchor rope from the Preservation to it. This was so we could have two lines leading to the anchor to facilitate the lowering of the drill press to drill into the granite rock for the mounting bolt. Pat and Linda found the Charlie Anchor and sent up their marker buoy, which was 25 ft from throw marker. Lucky shot or what?? Bob Olson, Phil Kerber, Bill Wallace and Kelly Murphy lowered the newly designed and built press by Bob Olson down the Anchor line to place it in the area of the Charlie Anchor for drilling. The second dive team of Bob Olson and Phil Kerber went down to try out the new Drill Press first. We positioned the drill press where we wanted it to be and began to drill the hole. The drill started out slow but got better as time went on. After a few minutes the drill press started to perform the way we expected it to perform. Kelly Murphy soon joined us to help in drilling the hole further into the rock. In about 30 to 35 minutes the one-inch by ten-inch deep hole was completed and ready for the pinch bolt. 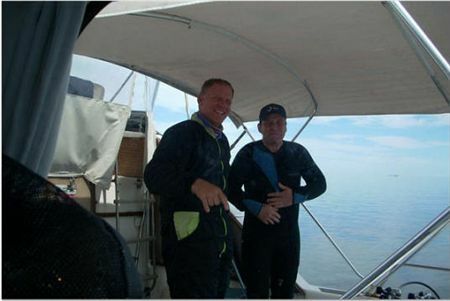 Stan Braun, the diver that found the Anchor, was there with his dive buddy Kevin to observe the events going on and were willing to lend a helping hand. The next dive team of Bill Wallace and Bob Olson ( Bob did double duty), pounded the pinch bolt in, attached the chain (made up by Bob Olson a few days prier to the project), to the Charlie Anchor. Bill Wallace peened over the bolt threads on the end of the bolt to make sure no one attempts to turn the nut off and steal the valuable and Historical Anchor. They then gathered all small tools that were used at the drilling site and brought them to the surface. 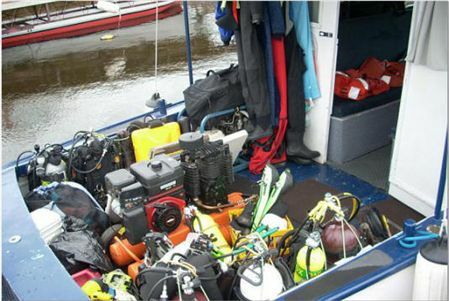 After we all removed our dive equipment and suits we brought up the drill press with the boat windless. Had lunch and, secured all other equipment to prepare for departure at 3:30 PM. We set a coarse for the Madeira to make a dive to check out the Pilot House. On the way we pumped tanks to prepare for the dive. We dived the Madeira to videotape the Pilot house to plan the procedures for the repairs it needs. (See videotape and still pictures of the Pilot House). This would facilitate a new and future Project for the GLSPS. We departed about 6:00PM for Knife rive to take on some fuel and for over night layover. We all woke up by 7:30 AM, had breakfast and, waited for the attendant at Knife River to sell us fuel. He finally came at 8:45 AM. We put 20 gallons in the tank, paid him and departed for Duluth. The cruise between Knife River and Duluth was just a little more rough than the initial cruise up north. The waves started out at 2 feet and increased to 5 before arriving at Duluth. The mighty Preservation had no trouble taking the 5 ft trailing seas. After arriving in Duluth, we stopped at Lake head Marina to completely fill the Boats tank with fuel. 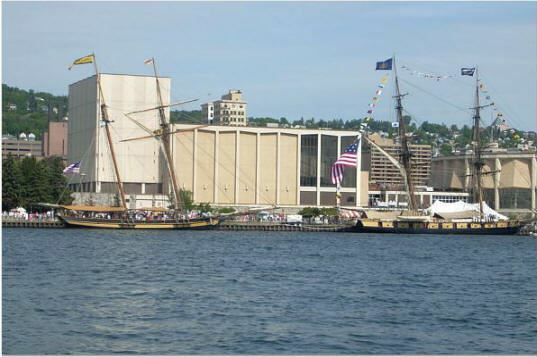 We also took on more passengers to cruse around the harbor to see the Tall Ships from the Duluth Tall Ships festival. It was a site to see. According to a bunch of emails I received they said there was around 150,000 people that attended the Festival. A storm was coming in so we dropped the passengers off and headed back to Spirit Lake Marina. (While in a rainstorm). Arrived back to port at 4:30 PM. (Sun was shinning)! Unloaded gear, cleaned up, did food inventory and dumped and cleaned the Head. Left for home again. DARN!